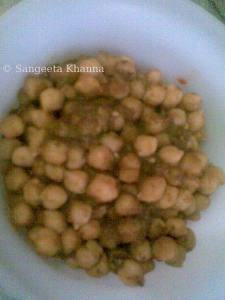 keeping in mind that a breakfast should be filling and nutritious.......chickpeas are a good idea.........as per my taste, i need a different breakfast everyday, so the concern always is that, my husband, also a variety freak , should like it and it should be easy n quick to make........this recipe comes to my rescue on weekends too when he likes to have puris for breakfast.........i serve him puris with this chhole and eat the chhole myself without the puris..........sometimes a sprinkling of chopped onions and bhujia is a great variation, specially if served as a snack. in the morning just boil the chhole with salt n water till 2-3 whistles in a pressure cooker. 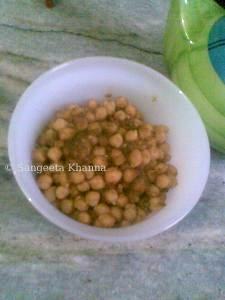 add the green paste to it and serve..........it can be served as it is, or like suggested above. i like spicy food ....it gives me a filling satisfaction and keeps my metabolic rate high.........yummmyyy. in the pic i have used tomatoes in the green paste instead of lemon juice...so the green color is not very prominent.